Here's a poem I did as a small part of my senior anthology project in high school. I was very much inspired by the poetry of Langston Hughes, whom I've loved ever since I discovered him in my 9th grade English class. It was one of those moments that, as an artist, I live for...the moment when what you envision in your head and what you put down on the paper are completely in sync. I also submitted this poem to my school's literary art magazine. I was Editor-In-Chief of the magazine my senior year of high school. I had loads of fun designing the magazine, editing the poetry and artwork of my fellow students and ultimately helping build a really cool memento. Working on the magazine and being in a creative publication environment definitely provided me with the inspiration for what I want to do in my future career - more reading, more writing, more art. With my children in the cotton fields. And the summer has taken my fear. But I am trapped, tortured, and forlorn. But over the white fence, I see the river. I see the river and it calms me so. I have seen you birth babes. And the master at their tongues. Have you seen my Grandmother? 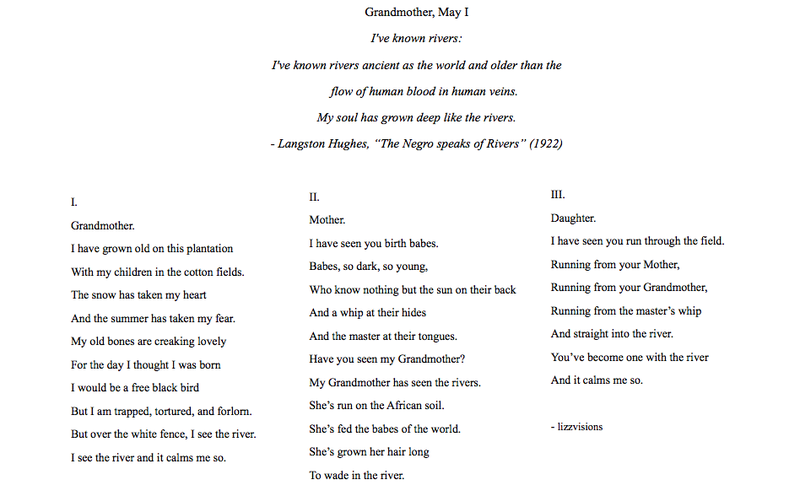 My Grandmother has seen the rivers. She’s run on the African soil. She’s fed the babes of the world. To wade in the river. I have seen you run through the field. And straight into the river. And it calms me so.